The shores of the Dead Sea. There it was! I stood at the edge of the cliff and marvelled at the scenery. It was one of those unforgettable travel moments. A place I’ve read and heard so much about and finally… I’m here! Stretching from below me to the distant horizon was the blue expanse of the Dead Sea; famous the world over for being the lowest point on Earth (the ‘sea’ is 420m or 1,400ft below sea level), for its extraordinarily high level of salination (it’s more than 8 times saltier than the average ocean) and for its numerous mentions in the Bible. One half of its name is misleading: it is technically a lake and not a sea. The other half is spot on: with that much salt in the water, the lake is pretty dead! I stood on the eastern shore of the lake that is part of the Hashemite Kingdom of Jordan. It was a clear day and I had an amazing panorama of the entire length of this 67km (or 42 mile) lake. It was simply breathtaking! I turned my gaze to the lake shore. The rocks were covered with a blanket of salt crystals, giving them an intriguing cauliflower-like appearance, whilst the water was a gorgeous jade. I couldn’t wait to get into the water and experience the wonders of the Dead Sea. An hour later, I was standing on the edges of the Dead Sea at the Mövenpick Dead Sea Resort, and looking at the rather comical scenes along the shore. People were floating on their backs in the lake whilst on the shore, others were slapping hands-full of mud onto their bodies. This is what makes the Dead Sea so special. Its salinity – which is so dense, it makes you float – and its therapeutic qualities. 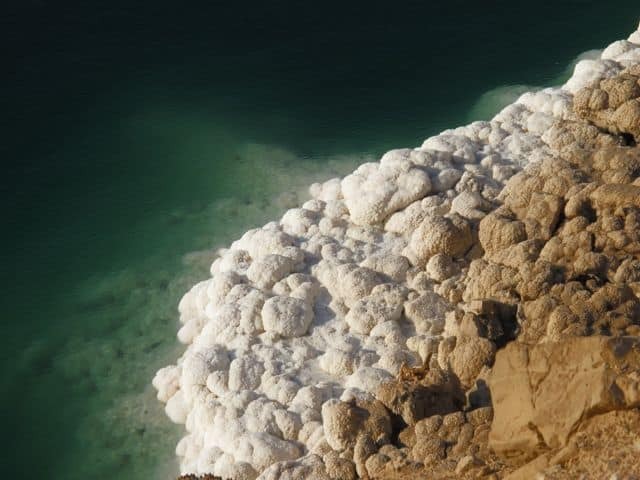 The water and mud of the Dead Sea have been recognised for their healing properties since Biblical times. Loaded with a unique blend of minerals, the water and mud are used to relieve skin disorders, sinuses and osteoarthritis. The Dead Sea has other qualities. Situated 420m below sea level, the lake enjoys a higher atmospheric pressure with more oxygen, as well as lower levels of harmful ultraviolet rays (you can stay in the sun for a prolonged period without sunscreen and not get burned). Did these qualities work for me? Well, keep on reading! Before long, I was slapping on the magic mud. Cuts and bruises I suffered from a mishap earlier that day started to sting as I applied the mud. I sat at the edge of the water for fifteen minutes before going in. My skin was immediately coated by an extraordinary silky film. As soon as I lifted my feet off the lake bed, the natural buoyancy took effect and I found myself on my back, bobbing around. I stretched my arms out wide, slid my hands behind my head and I crossed my legs. I wouldn’t know how else to describe the feeling except: AWESOME! I looked at the changing colours of the sky and the lake as the sun set. The sky was illuminated with shades of crimson and orange whilst the lake turned to a shimmering gold. Across the lake, I could see the twinkling lights of Bethlehem, Jerusalem and Jericho in Israel. The scenery was bewitching. 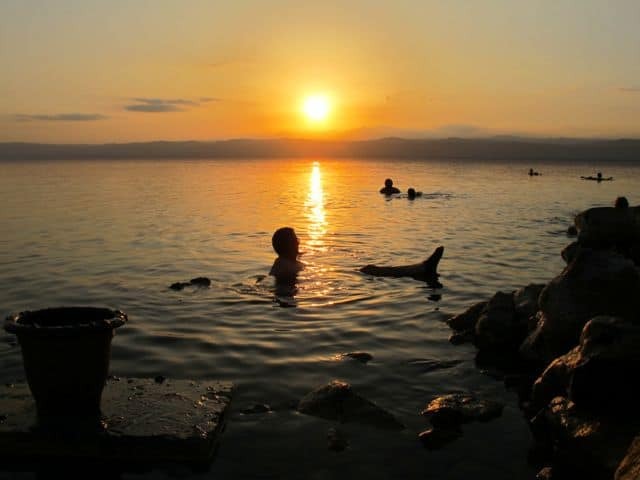 Floating in the Dead Sea at sunset is a magical experience that no one will easily forget. After a shower at the lake shore, I sat on the panoramic deck and watched the final minutes of the sunset. I felt so relaxed (I’m quite sure the higher oxygen level had something to do with it) and my skin… wow, my skin felt incredibly soft. I found that quite remarkable. My skin normally requires layers of body lotion to stay hydrated, especially in dry climates. Not at the Dead Sea. Without any moisturiser, my skin felt great and there wasn’t a hint of dryness! 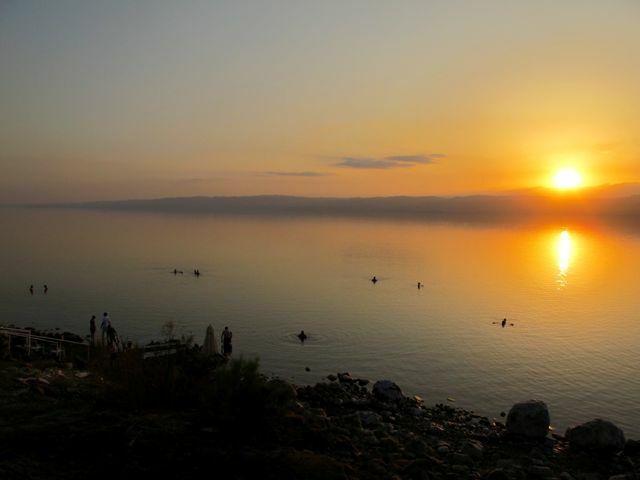 I looked at the glorious colours of the sunset and the people floating, some hand-in-hand, in the Dead Sea. 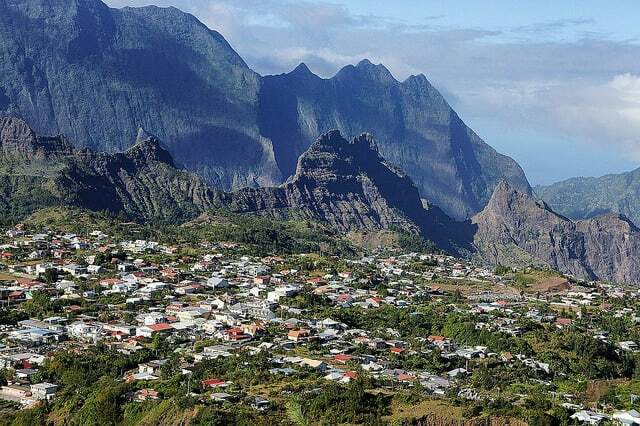 It was a bewildering experience, one that deserves a spot on anyone’s travel bucket list. For sure. 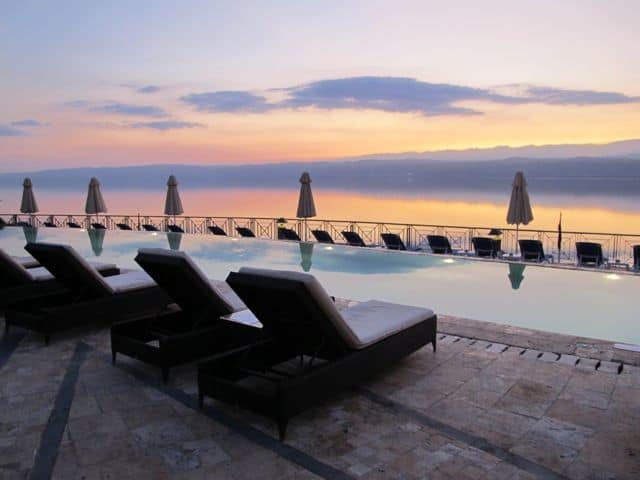 The Mövenpick Dead Sea Resort & Spa is one of several resorts that line the Jordanian shores of the Dead Sea. Of these resorts, the Mövenpick is an excellent choice because of its authentic character, friendly service and great food. In addition, it is home to one of the most elaborate spas I’ve ever been to! Designed to reflect the style of an Arab village, the resort consists of a main building and various blocks that gradually descend to the lake in terraces. I loved the cosy, laid-back atmosphere as well as the lush greenery, beautiful trees (including 2000-year-old olive trees!) and flowering shrubs. There are three pools to choose from and nine restaurants and lounges. The resort’s Zara Spa is a labyrinth of treatment rooms, pools and relaxation areas. 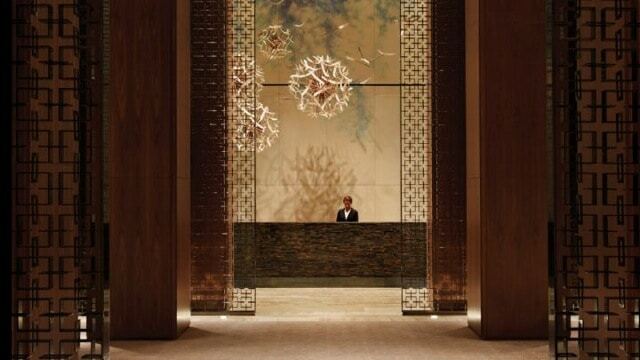 The Spa is a whopping 6,000 square meters or 1.5 acres! I’ve never been to a spa this massive and with so many different types of treatments on the menu. I opted for the Dead Sea mud wrap. Covered in the gooey mud, I nodded off within minutes of the soothing head massage. After my treatment, I explored the rest of the spa, including the outdoor hydro-pools and the indoor Dead Sea pools. 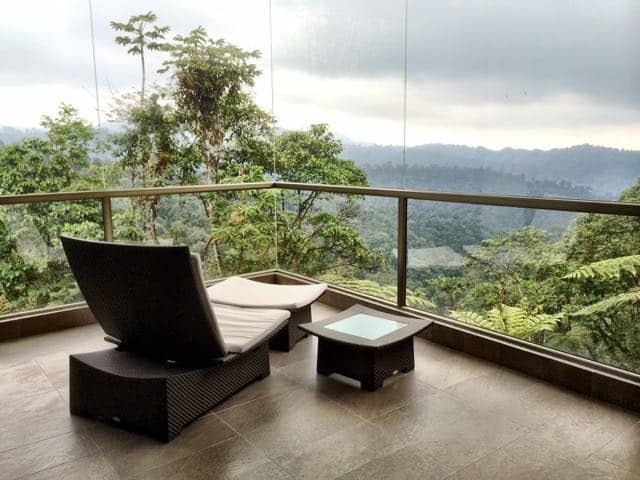 A hydropool with a view at the Zara Spa! 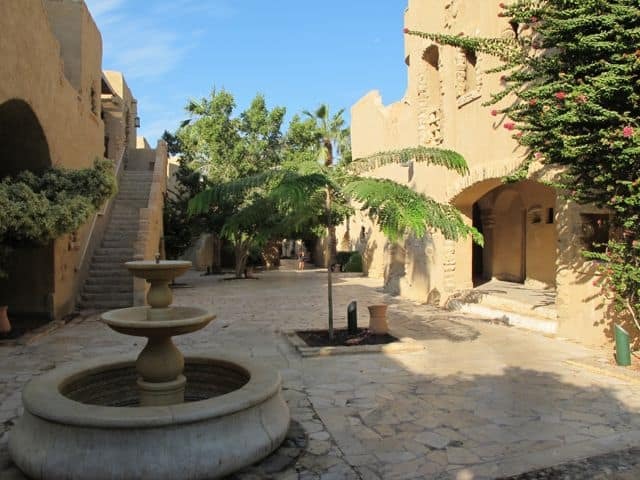 The resort is an hour’s drive from Amman and makes a great base from which to explore the sights along the Dead Sea and the Jordan Valley. Or you can simply sit back, relax and enjoy the stunning view, float in the Dead Sea or indulge yourself at the amazing Zara Spa. And at the end of the day, there’s nothing more enchanting than sitting at the pool lounge, cocktail in hand and admiring the fabulous sunset. Note: A big thank you goes to Visit Jordan and Mövenpick Hotels for your gracious hospitality. As always, views expressed in this post are mine. Really? I didn’t know that. Where is it? Great post. I also found the experience a bit surreal and magical. Bobbing in the sea was part of that, but also found watching it mesmerizing — it sparkled all afternoon and into cocktail (reflection off the crystals?). Thanks for the interesting post Keith! Those photos look amazing. I have a few friends that have been, and I hope to see it one day as well. Keep traveling! Thanks for describing your experience floating on the Dead Sea so eloquently, Keith! Sounds like bliss. Jordan’s been on my list for a while and now I can’t wait to float in the Dead Sea at sunset. Great post, Keith! We only had a few hours at the Dead Sea and I really want to go back someday. For travelers going: cover yourself in the black dead sea mud! We didn’t and looking back now, I really wish we had! It helps sinuses? Why hasn’t this been mentioned before? That’s enough to make me book a flight out of this Winter Wonderland/Sinus Cesspool! This looks gorgeous and so relaxing! A magical experience I definitely want to try! This is so beautiful and relaxing! it really makes you jump in the plane and get there! i bet you had a wonderful time there. THANKS! 🙂 It’s one of those magical experiences that simply should be on anyone’s bucket list! Oh Keith! The way you described that … we’re sure the next flight out will be full just to experience what you experienced at the Dead Sea. Incredible. On our bucket list for sure. Wow, thank you Jeremy for the compliment. 🙂 It was such an amazing experience. Really, it wasn’t hard to write this account. 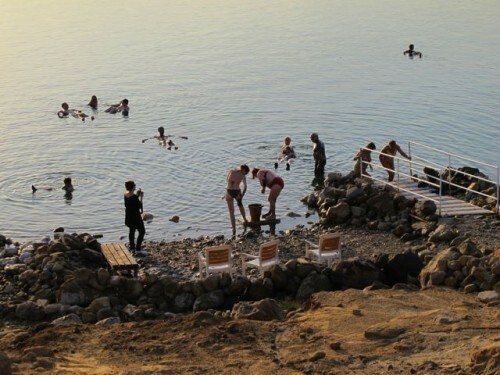 One of the best posts I have read on the Dead Sea. You give a beautiful account of your experience and history. I’ve tried so many times to float and I just can’t do it. At least there’s one place on earth where I know I can. Amazing experience!